How hard can it be to get eligible citizens out to vote on election day with honest results? Should be easy, right? We are taught through grade school that once we are old enough everyone has a right to vote and every vote counts. You might think, there are laws in place today along with technology that makes the elections process simple. 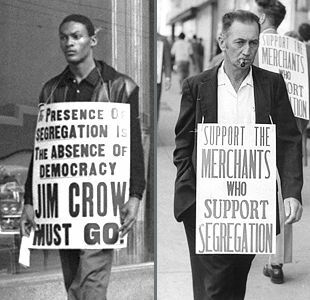 The poll taxes, literacy tests and physical violence of the Jim Crow era have disappeared with the passage of the Voting Rights Act of 1965, right? The truth is that in almost every national election since then, voters still have faced a deliberate and calculated attempt to intimidate and suppress. More often than not this threat is pointed towards Africans American and minorities. In August of 04, armed and not in uniform officers intimidated many elderly African American voters in Orlando, Florida, by going to their homes and interrogating them as part of an odd investigation about voting irregularities in the previous mayoral election. In South Dakota, Native American voters were prevented from voting after they were challenged to provide photo IDs, which they were not required to present under state or federal law. According the Springfield News Leader, up to 58,000 voters, many who were African American were prevented from voting because voting machines were not delivered to New Orleans in time for voters to vote on September 18, 2004. In 2002 in Louisiana, flyers were distributed in African American communities telling voters they could go to the polls on Tuesday, December 10th – three days after a Senate runoff election was actually held. In 2008, there was also plenty of examples. In October, New Mexico had newly-registered minority voters declared in a press conference by the NM State Representative to have fraudulently voted in the state primary elections. A private investigator was later hired by a party official to go to the homes of these voters and interrogate them about their citizenship status. After a rally in Fayetteville, North Carolina, supporters of Barack Obama went to a nearby early voting center, where they were heckled and harassed by a group of protesters as they went in to vote. Nearly all of the early voters were black, and nearly all of the protesters were white. In Virginia, students at Virginia Tech were told that if they registered to vote in Virginia, it could affect their scholarship or tax dependency status and would obligate them to change their car registration and driver’s license to their permanent address. A poll worker in Dearborn, Michigan was perceived to be intimidating Muslim Americans along two precincts being reported for the presence of police scanning the long lines for voters with outstanding warrants. In most of these cases people have been tried and convicted. Too bad the maximum penalty for conviction on a charge of voter intimidation under federal guidelines is a fine and/or no more than one year in prison. This is hardly a deterrent for big organized groups with careers on the line with each election. This is the type of issue that should cut through party lines and take whatever measure possible to eliminate it. Voter fraud and intimidation in any form is unacceptable and one of the worst forms of corruption. That is why I am highly disappointed with the news from the Department of Justice about the dismissal of the following voter intimidation case. A poll official named Bartle Bull, a former civil rights attorney and aide to Senator Robert F. Kennedy’s in his 1968 presidential campaign, gave DOJ attorneys a sworn affidavit. Unbelievable testimony. The accused didn’t even bother to show up and defend themselves or file any response to answer the suit. So it seemed certain the DOJ would have prevailed by default. Instead the Administration decided to drop three of the four cases and punish the final one with an incredibly weak injunction. When I say incredibly weak, I mean he was barred from brandishing a weapon within a hundred feet of polling places in Philly through Nov 15, 2012. That’s right, his punishment is to obey the previous law, only in Philly and only for the next four years!!!!! The other three were let off without explanation. But were they just lucky? One of the defendants is Jerry Jackson a member of a Democratic Committee and a credentialed poll watcher for the precious election day. This information brings some credence to the prevailing thought that this is more than just a slip up. I have been skeptical of President Obama and Eric Holder, while still trying to give them the benefit of the doubt with their past judgments. In this case, there is now way to explain the results. Career attorneys at the DOJ say this is unprecedented and have no explanation for the rulings. The DOJ has dodged news outlets and provided no information to filing lawyers. I can only justify this by looking at Holder and Obama’s calculated political motivations. The administration must be fearful of alienating their core voters by punishing the New Black Panthers. Perhaps they knew the media would overlook the story. Whatever the case may be, I sincerely hope this decision is thought through with justice and the integrity of our elections in mind. Silly. Just in case anybody should somehow be swayed by your impassioned plea for justice, let’s just consider: how many voters were deterred by the actual presence of a couple of black guys at their polling booth in Philly? “WE MAY NEVER KNOW! COULD HAVE BEEN THOUSANDS!” I hear the ditto-heads scream. Well, as someone who has lived in Philly all my life, I don’t think most voters would have even noticed these guys. We have all sorts of colored folks here! Lots of them are really scary! Screaming at all the honkies about how they’re the lost tribe of Judah and the white man is the devil, or Jesus was black man so buy my shea butter and incense or buy the Socialist Worker or buy Final Call and “Asalam alekam!” I’m glad that you are outraged by all the past injustices against disenfranchised folks, but it seems a little, well, racist to put the brutal and institutionalized repression of the voting rights of blacks on the same level with the assumed intimidation some whites caused by the mere presence of a couple of scary looking negroes. “Conservatives” are really grasping at straws with this one. Haha your right they were just security there. Did you know there are a few cases in which republicans have tried to get police officers to stand outside of polling places for ballot security. Well it was shot down, apparantly minorities and criminals would be intimidated by the presence of actual police officers at the polling stations. So if actual police officers can’t be allowed to be near polling stations in uniform or out of uniform than the NBPP can’t organize security around the poll places either. “you know there are a few cases in which republicans have tried to get police officers to stand outside of polling places for ballot security…” Are you raising this point because you are offering an example of the republican party doing something similar to the NBPP or are you trying to insinuate that the Democratic Party enlisted the NBPP for security? Because that would be funny if I didn’t think there were people in this country who are ready and eager to believe such nonsense. Slightly off topic: I did not know that it was illegal to have cops at polling places. There are always uniformed police officers in my polling place. I never thought of it as intimidating. Perhaps it is different in different states? Of course the NBPP was wrong to assign themselves a “security detail.” They are wrong about most things. They are after all a just a small group of screwed up dummies with a bizarre communist platform — that they themselves probably don’t unerstand — who like to play dress up. While I don’t necessarily see their clothing as intimidating, I can see how some people might. They are not even affiliated with the real terrorist boogeymen Black Panthers of the 1960’s and 70’s culture wars. Black Panthers standing at a polling place dressed in full garb with bill clubs yelling at white folks in a clear case of voter intimidation, documented, and supported by civil rights groups, amongst others, is your chance to label others as racists? The point is not about the number of deterred, or about past instances of racism, or your so called “assumed intimidation.” Its about the hypocrisy of Attorney General Eric Holder and his blatant disregard for the law especially en lieu of his other statements…. Turn the tables around, take a few whites in rural alabama with bats dressed in full on militia unis and confederate flag bandanas, would you be using past examples of “brutal and institutionalized repression of the voting rights of blacks” as reason for it not being a big deal this time? If that happened and civil rights groups called them out, would i be able to scream racism? Didnt think so. Your hypothetical turned table is incredibly naive. Do all conservatives really not understand that there is a world of difference between such actions in a society with a brutal history of violence against blacks, and this isolated incident in which no violence was reported and the only allegation of intimidation comes from the GOP operative camera who may have had just an eentsy weentsy agenda and desire to start a little trouble? Oh, and someone forgot to tell that white lady going in behind those scary black people that whitey wasn’t welcome there.The fact of the matter is that there was no case for the Justice Department to pursue. Admit it to yourself and you will feel a lot less foolish. You seem to be a little less ignorant than those who would mindlessly swallow anything Fox News “reports” on. Why not use this blog for intelligent commentary instead of fanning the flames of racial hostility? Appreciate your response and interest in the topic – you obviously are very educated in what you speak of. However, I do disagree with your assessment that we are using the blog to fan flames of racial hostility. This statement is a typical, lazy tactic used on liberal blogs across the web. Conservatives are not allowed to discuss anything related to race without being called racist…or if you are a minority, an Uncle Tom. Somehow progressives feel they have earned the right to judge others – which is ironic, because racism is built from the idea that one person feels superiority over another because of their background. I dont need to defend myself personally – I know the balance of friends and co-workers I have across all races and the charity work Ive done in the past. Keep to debating the topic, but hold off on the merit-less claims of racism. Let’s get this straight: I am no fan of the current administration. Much less so than I was of the previous administration, in fact. And I did not accuse anyone on this blog of being a racist. I stand by my assessment that this type of reporting is more often than not consciously intended to fan flames of racial hostility for reasons I have already stated: knowingly misrepresenting an incident as being akin to hundreds of years of brutality and disenfranchisement as well as the insinuation that this administration (full of faults as it may be) is somehow in cahoots with these idiots and that this is demonstrative of their incompetency… As a black man with conservative leanings — have you figured out how I stumbled on this blog? You weren’t the “conservative brothers” I told google to look for 🙂 — it just gets tiresome to be expected to support the more and more ridiculous false outrage served up by the “conservative” media. I’m getting tired of Fox News increasingly becoming the assumed voice for all conservatives and I am getting tired of their constant pandering to the lowest common denominator. In my opinion they do a lot more harm than good. It makes us look like idiots or at the very least like people who tolerate the company of idiots. I am not a Constitutional Lawyer and I do not know how unprecedented the DOJ’s actions are. On first blush, they don’t appear that egregious to me. That is all. Back to work. Ha, thats fair enough – I didnt consider your google search, but that’s pretty funny. Admittedly, when I think about it I dont always disagree with a Beck, Hannity Rush, but I think their delivery sets back the conservative movement. You cant deny they have a voice in the party and their viewership is important, but I dont think turning off half the nation helps either. Many wont consider the validity of our points of view solely because of these guys. Look what happened when polls are done between ideas of Dems vs ideas of Repubs. When they aren’t labeled as such, Repubs continuously come out on top. I think O’Reilly gets a bad rap because he is successful. But I like guys like him, Medved, and Scarborough. All intelligent and fair, IMO. I dont think Tims intentions were to compare this case to events from the 60s, but Im not going to tell you how to you should feel about it. Personally, I think the more larger and important point of this piece is the hypocrisy by the DOJ not the color of the skin of those involved. I do think if we were talking about a case with whites on the steps with clubs, this case would be prosecuted. Do I know that for fact? No. But I feel its a pretty likely scenario. Im fanning the flames or racial hostility? The person taking the camera vid is a GOP operative, and at fault trying to promote an agenda? Listen to what you’re saying for a moment. Dont point to past bad behavior as justification for current ones. It simple doenst work. You’re still missing the point and never answered any of my questions. 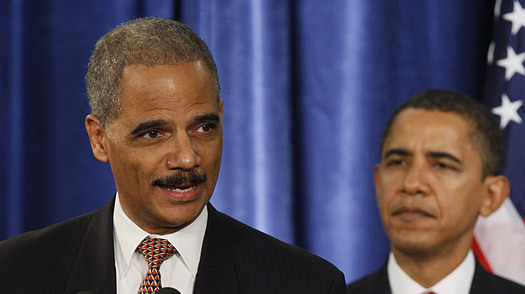 There was a clear case for the DOJ to pursue, and they did until the gentlemen failed to show and Holder decided to squash it at the behest of common sense, evidence and angry civil rights groups, who realize that letting clear examples of voter intimidation such as this go, only undermines the good these groups have worked for in the past. Here’s something that may help you, although its human nature to not forget grave injustices from the past, it doesnt do us any good if we dont learn from our previous mistakes. Calling my hypothetical naive for judging it by its merits and legality is absurd. And using that logic, another crime committed by anyone can be written off due to any number of prior unfair circumstances. Victimization is a powerful and destructive thing for anyone to accept. In this case i blame no one but Holder. Yes, you are fanning the flames of racial hostility. Yes, the camera man was on assignment and being paid by the Philadelphia Republican Party who dispatched him to a scene where GOP lawyers had gotten the natives all riled up. I’m not justifying anything. It’s not nice or particularly legal to stand around a polling place with a stick. I’m sure if I stood around a polling place with a stick that I would get in trouble. I don’t think I would necessarily make it onto the top of the Attorney General of the United States personal to do list, though. So the question is, what are you implying about the Obama administration and Eric Holder? That they are racist against white people? That have some kind of love for this little “New Black Panther Party” club? Because you’re obviously implying something, I just hope it isn’t anything that silly. clearly, I wasn’t putting the repression of black votes on the same level as this instance. I was mearly noting that throughtout history minorities have seen the worst of it. Sorry that wasn’t evident. I would like to understand your stance that conservatives are “reaching for straws” or that there was “no case” here. It doesn’t have anything to do with race or fox news. It just seems simply illegal to me and attorneys at the DOJ (by definition of the law). Lol you wouldn’t make it to the top of the list… you would have been prosecuted by default for not showing up to the hearing. Do you have any credible sources that say it was a republican party operative? lol like the operatives at the town hall meetings…. Anyway it doesn’t matter if the republican party discovered it or not, its still a crime right? Here’s a piece written by the videographer stating that he was in fact being paid by the Pennsylvania Republican Party. From Mother Jones, of all places. And of course it doesn’t matter who discovers a crime, but it does matter who alleges a crime and how it is defined. Perhaps the Justice Department dropped the case because they couldn’t find any credible witness accounts that convinced them that anything worthy of prosecution had taken place. The one allegation of being turned away comes from a mystery caller who just happened to have a paid Republican videographer’s phone number handy. I guess I just don’t get it. These clowns were hanging around, the cops came and took them away, Justice Department files a Civil Complaint against them, obtained an injunction against the only one seen to be doing anything illegal. The “uproar” just reeks of a desperate Republican party clinging to old fear mongering tactics. You say you weren’t “putting the repression of black votes on the same level as this instance,” but this is clearly the intended effect of those who are working so hard to cultivate outrage over this incident. It is also readily apparent that conservative media is trying to insinuate that the Obama administration and Holder would somehow have something to gain by not pursuing this group, or perhaps that there is some political connection between this group and the administration. Even if you don’t believe, take a look at some of the discussions in “cyberspace” to see the NBPP described as Obama’s Brown Shirts. Truly unbelievable. But that is how deep the racial divide is in this country. Thanks for that link… did you notice he works independently and had previously worked for the dems? Credible witnesses… how about the cops who took them away? How about the video? how about the sworn affidavit? More importantly if your familiar with law at all, you might recall that when the give the federal court the bird and refuse to show in court at all there is no need for witnesses. You are prosecuted by default. clinging to fear mongering attacks… lol come one. Just simply stating that the law was broken, defendants didn’t bother show in court, and the DOJ unprecedently dismissed the case. That is not fear mongering! The outrage is cultivated because it should be easy and simple to prosecute those who inflict damage on the democratic process. The Administration could offer a simple statement that would stop the uproar of the crazies and attorneys who are perplexed. I don’t condone or give credence to those loons who play the racial divide. But unfortunately they have room and a base to run wild with this crazy decision. Yes, the videographer is an independent contractor. Working a paid assignment for the Pennsylvania Republican party. Not to mention the very tone of that MJ piece strongly hinting, at least to me, at where his political sympthies lie. But you believe what you want to believe. And if you feel it is your duty to make others believe it, that is your right. Obama and Holder are keeping the white man down by working with the New Black Panther Party to intimidate any white people who show up at one isolated polling place where the citizens vote over 90% Democrat. If they prosecuted this fringe group, Democrats would now feel totally betrayed. It makes perfect sense. Of course his tone was sympathetic towards republicans/whites…. he witness a crime being committed. You would expect the average Joe to think nothing of this? I am not persuading anybody to believe anything. Just showing were injustices have been done. I do speculate that their is political motivation behind the decision but that comes after I site sources who have no idea why the decision happened. Again, if you have any idea on why this happened please enlighten me.